Major incident trauma is something that anyone could need to deal with but this course is also aimed at the emergency services. Catastrophic injuries from multiple casualty incidents are something that unfortunately is a real situation that first responders and members of the public may have to deal with. The course covers keeping yourself safe and triage of casualties. It also covers many different types of catastrophic injuries and how to treat them. 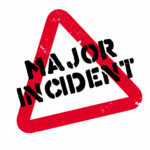 Dealing with a major incident you may find yourself with multiple casualties and need to keep yourself safe. This course discusses the types of injury that you could encounter and how to treat them. If you want more information on dealing with medical emergencies then we have a 20 hour First Person On Scene course. This course is also ideal to increase your first aid knowledge after you have learnt on other courses. This video online course is also available as a classroom course nationally or as a blended course where you learn online and then complete a practical session with an approved ProTrainings instructors locally. Visit the Major Incident Trauma course by clicking here or contact us for more information on 01206 805359. LO1. Understand the hazards that pose a risk to person safety when dealing with a major incident and performing a dynamic risk assessment. LO2. Explain the ways in which the responder can be harmed by injury and infection and selecting the correct personal protective equipment. LO3. Explain the DRCA(c)BCDE protocol in treating traumatic injuries. LO4. Explain how the emergency services integrate to offer effective care. LO5. Understand approved methods of triage and communication between responders and the emergency medical services. LO6. Explain the concerns and treatment for different types of catastrophic injury. LO7. Explain how to use a tourniquet in the treatment of a catastrophic extremity bleed. LO8. Explain how to treat a catastrophic bleed with haemostatic dressings and agents. LO9. Explain how to continue to monitor a patient and treat for shock. LO10. Explain how to hand over to the EMS. LO11. Understand the concerns of post traumatic stress.